Welcome to Ghosts 'n' Goblins Online, the only (as far as I know) website on the internet dedicated to this infectious game. At least the FIRST. There seems to be a pattern among Ghosts 'n' Goblins players in that they all remember this game affectionately and all have been affected in some nostalgic way by this game. Simply put, we all have fond memories of playing the game and there was just...something about the game that made people long to play this great game again. It is my hope that this humble website will provide all the information, tools, and files needed for the full enjoyment of this great game. This site best viewed at 800x600 resolution. 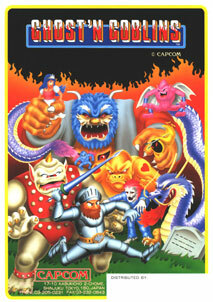 Ghosts 'n' Goblins is the respective trademark of Capcom. All the graphics on the webpage are the creation of Firebrand (webmaster) and may be used only with permission from the author. Files on the Multimedia Page were collected from various free and publicly available websites and free donations by individuals. None of the content has been taken from fee-based websites. The Ghosts 'n' Goblins marquees, cabinet, and flyer pictures are computer image reproductions of actual marketing and decorative images, owned by Capcom.